different panels. Click to see larger view. 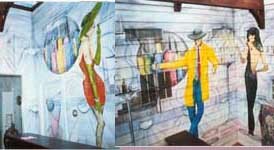 A client had contacted me a few years ago wanting to do a mural at her town-home near the Post Oak/Galleria area. Not sure what she was looking for, she interviewed a few artist. I had this slick design, sheik figures in an Art deco style to show her. I personally like art deco and it was a style I had done in the past and enjoyed creating and when I showed her the idea - she liked it and it was a go ahead. To best show her my vision of what I wanted to do, I had the image printed on a transparency sheet and with an overhead projector I projected the image /art on the wall. This also helped her see the actual size. The figures I proposed were to be around 17 Ft. high. The ceiling was 20 Ft. high. Another major problem we had to address and over come was that the walls were a ship-lap style and the images to be painted had to be a painted in a way that the line in the painting have contiguous line and smooth not broken up by the ship lap wall which was had been an outdoor patio that had been enclosed t and converted to a home lounge with a bar. To keep the art consistent with what I had originally created, the project was pretty much all airbrush. The project was started by projecting the images up to size. Then we put application tape on the wall and then the images were outlined and sketched with charcoal pencil. To start painting I only need a line sketch to start. In doing this job I used the a technique of cutting friskets and airbrush paintings. A three-tier scaffold was needed due to the 20 ft. ceiling and the size of the figures. 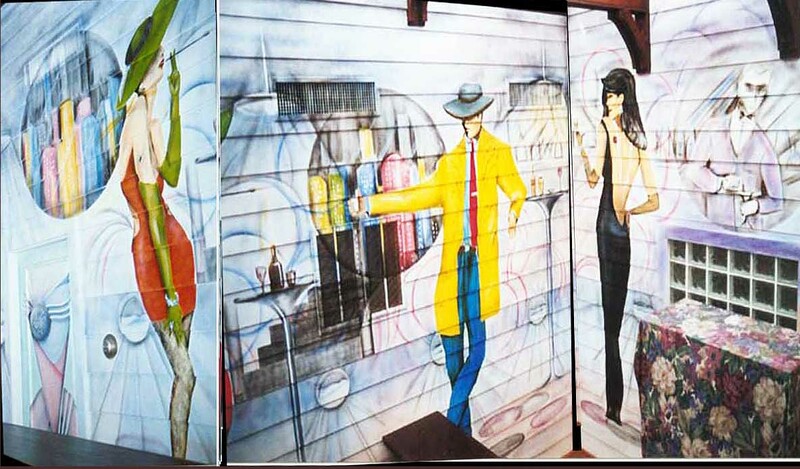 The mural consisted of three 17 Ft. tall, two women and a male art deco style figures. The figures were high fashion, bejeweled high fashion figures. One of the ladies even has a black widow tattoo, requested by the client - go to see tattoo detail The figures juxtaposed a simulated a New York skyline. The client's main objective was to cover the white wall space. The mural did that pretty well. The three images were painted first. Then they were covered and the back ground was painted. The other elements were added as needed to fill out wall space. I had done something similar to this back in early 80's in Hartford Connecticut in a place called 'Standing Room Only', a Hispanic social club (go to see that project). Based on that experience I knew how to approach this mural. After the west wall was finished, she wanted something done on the opposing east wall. I had not planned for anything on that wall. Again her main objective was to paint the wall instead of the plain white walls. So I came up with a idea based on something I had proposed before, for a bar/lounge in Waterbury, Connecticut. I was pretty simple, but very interesting. It was a impressionistic mountainous scene, waterfall and a coyote in the center. The colors used were a golden orange, purple, yellow that bounced off the existing colors found in the room. All in all - it was an exciting mural project for me and the client loved it (Go to read her Comment, first one on left by EE). We provide free consultations. You can see the projects clicking on the indicated links above, or at our art related sites: www.GaticaArt.com, www.MuralsandBigArt.com and at www.AirbrushMagic.net.